Usually Autumn in Switzerland is cloudy, grey and wet. This year, however, we’ve had an abundance of unseasonably mild and sunny days. Pretty much every weekend we’ve been able to enjoy long hikes, mountain visits or strolls by the lake. Yesterday we finally made it to Jucker Farm for a truly autumnal experience - pumpkins! I’ve been seeing pictures of this place EVERYWHERE - my Instagram feed has been filled with other locals posing in front of the most amazing pumpkin sculptures. As an American, visiting a pumpkin farm is an essential Fall rite-of-passage, so I’ve been dying to go and give our 10-month old daughter her first experience! It did not disappoint. Juckerhof is located on the shores of Pfäffikersee in Seegräben - about an hour’s drive from Lucerne. It’s open every day of the year, it’s FREE and is one of the most beautiful pumpkin farms I’ve ever seen. The farm courtyard has a beer-garden-meets-farmer’s-market feel - lot’s of picnic tables nestled under shady trees, surrounded by food stalls (there was fresh pumpkin soup prepared over an outdoor fire, grilled sausages, crepes, a bakery and two restaurants with more hearty fare), all with the backdrop of a vineyard along the lake. 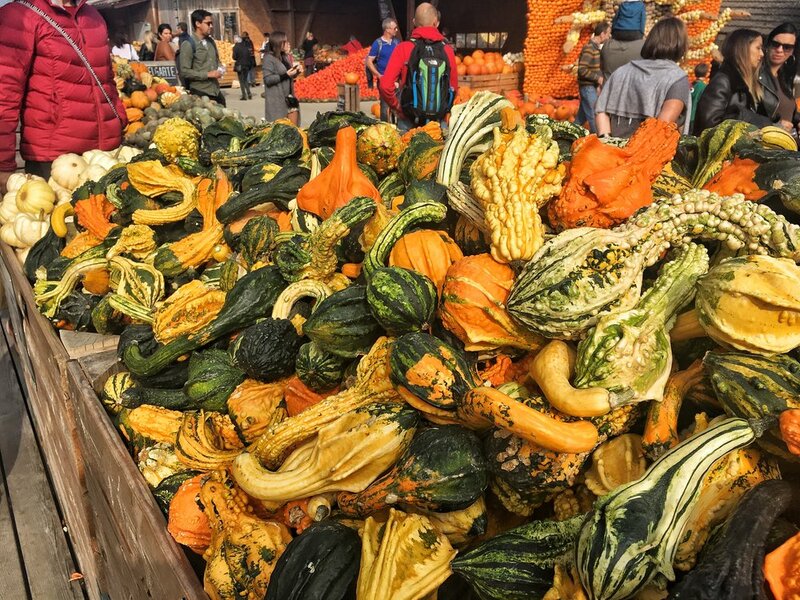 Beyond the thousands of pumpkins on display and pumpkin products (oils, roasted seeds, chutneys, spaetzle) available for purchase, there are a number of activities to fill the day. There is a small petting zoo with goats and rabbits. There is an apple orchard with labyrinth and barefoot experience (for a fee). There is a pumpkin carving and kid’s craft area, hay bales to climb and several hammocks to swing in. But the most impressive are the elaborate pumpkin sculptures. Every year there is a different theme and this year’s was mystical creatures. Obviously I had to get a picture in front of every one - unicorn, dragon, phoenix, elf, Medusa. They were seriously cool. Of course, we had so much fun walking around and taking pictures, that I actually forgot to buy any pumpkins to bring home. I’m the worst. Regardless, I’m already looking forward to going back next year when our daughter is older and can actually run around and really enjoy everything.